Sebastian Scotney applauds the tenor sax man’s music in London Jazz Festival. 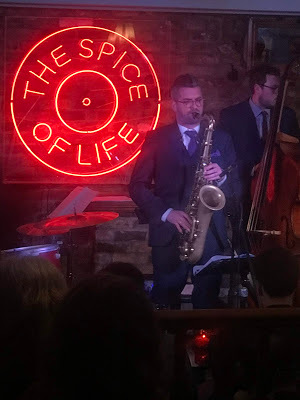 Another young-ish tenor saxophonist left a very strong impression with his gig on Wednesday at the Spice of Life club in Soho. Leo Richardson’s 2017 album The Chase, with a guest appearance from that daredevil of a previous generation Alan Skidmore, made it into several 2017 best-of lists. Richardson has just recorded another album, which includes another two-tenor roast, this time with Alex Garnett. Richardson’s quartet is also interesting for the sheer range of appealing characters and personalities in it, from the quirkily humorous Rick Simpson to the virtuosically insouciant Tim Thornton to the constantly provoking Chris Draper. For the full review, please click on the image, above.